This chapter reflects on the level of people’s participation in politics and governance through their representatives in the Nigerian National Assembly. The study is built on the proposition that the level of people’s participation in governance is significantly influenced by the media of communication between the constituency and legislature. Thus, studying constituency-legislature relations could be seen as one of the major templates for assessing legislative effectiveness. 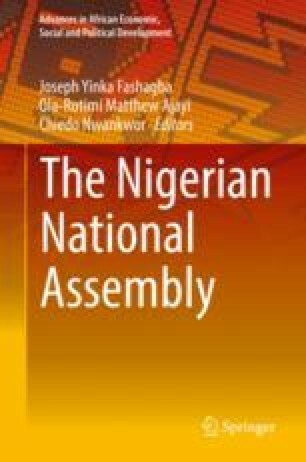 It is against this backdrop that this chapter examines the patterns of constituency-legislative relations in Nigeria with the objective of assessing the viability and effectiveness of the media of communication adopted by Nigerian legislators in harvesting and aggregating the opinions of their constituents. In addition, the study is probed into the research question that: to what extent do the opinions of the constituents shape the floor behavior and arguments of Nigerian legislators? Based on field survey, the chapter found that most of the media are not effective mainly as a result of the citizens’ misconception of legislative functions. The high poverty rate and infrastructural deficit in the country prompted many people to often use the media to request for financial and social supports from their legislators. The inability of the legislators to meet these requests prompted their disconnection from their constituencies leading to frosty legislature-constituency relations. CID. (n.d.). The Legislature and Constituency Relations. Available on line at http://www.cid.suny.edu/publication1/Legialture%20Constituency%20Relations.pdf (Accessed on February 25, 2017). National Democratic Institute - NDI (2008). Constituent Relations: A Guide to Best Practices. Available on line at http://leg.mt.gov/content/For-Legislators/orientation/constituent-relations-ndi.pdf (Accessed February 25, 2017).